10 April 2018 marked the 20th anniversary of the signing of the ‘Good Friday’ Agreement, the historic peace deal that ended nearly 30 years of conflict, a period known as the ‘Troubles’, in Northern Ireland. Our Northern Ireland series traces the long history of the Northern Irish conflict, and explores how the peace process is bedding down 20 years on from the Good Friday Agreement. A ChromeRadio production in partnership with the Handa Centre for the Study of Terrorism and Political Violence at the University of St Andrews. With thanks to Queen’s University Belfast and WAVEfor their assistance in setting up the Witness interviews. 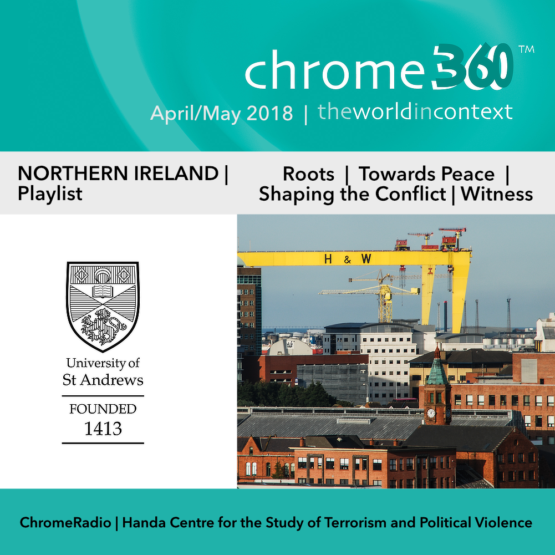 Roots: Dr Tim Wilson, Director of the Handa Centre for the Study of Terrorism and Political Violence, University of St Andrews, explores the roots of the Northern Irish conflict, from the plantation of Ulster in the 17th century to the suspension of Home Rule during the First World War. Towards Peace: Dr Tim Wilson continues the history of the Northern Irish conflict, taking us from the end of the First World War, when the British government turned once again to the Irish question, through a turbulent 20th century that ended with the historic ‘Good Friday’ Agreement and began the peace process we know today. Shaping the Conflict: Dr Kieran McConaghy, Lecturer at the Handa Centre for the Study of Terrorism and Political Violence, University of St Andrews, talks about growing up in County Armagh, making sense of different political narratives, and how the state’s response to political violence shaped the Northern Irish conflict. Witness: we travel to Belfast to hear from those who lived through and were involved in the Troubles. We find out how the ‘Good Friday’ Agreement has changed everyday life for them, and how they see the future of Northern Ireland. Peter Heathwood’s family came over to Ireland during the Plantation of Ulster in the early 1600s. Aged 26, Peter was shot and left paralysed in a case of mistaken identity. He now campaigns with WAVE for appropriate financial recognition of the needs of all those injured during the conflict. Shirley Moody’s husband was shot when he was 16, and he still lives with the legacy of those injuries today. Shirley coped with the aftermath, and the challenges of bringing up a family of sons and keeping them away from the paramilitary organisations during the Troubles. Former IRA prisoner Michael Culbert now runs Coiste, an organisation that looks after former IRA prisoners and their families. At the Coiste office in West Belfast, he and former British soldier Lee Lavis reflect on their personal journeys from being on opposite sides during the conflict to working together now for peace. A former member of the Ulster Defence Association (UDA), Colin Halliday spent time in the Maze Prison during the conflict. He now runs Lisburn’s People’s Support Project, originally set up as Lisburn Prisoners’ Support Project to help former prisoners from the UDA and its military wing, the Ulster Freedom Fighters, to reintegrate into society. Roger McCallum served in both the Royal Ulster Constabulary (RUC), and its successor, the Police Service of Northern Ireland. He is now involved in various peace and reconciliation initiatives, and is a Trustee of the RUC George Cross Foundation. This entry was posted on Tuesday, April 10th, 2018 at 7:34 pm and is filed under Chrome360, News, Our work, Podcast. You can follow any responses to this entry through the RSS 2.0 feed. You can leave a response, or trackback from your own site. I have only listened to Shaping the Conflict and the first Witness track: Peter Heathwood. I am astonished already by the quality and depth of what l’ve heard, and will return the the cloud, eager for more! I grew up in Belfast, child of a Catholic mother from a tiny farm in East Galway, and an English atheist father from southern England, who never admitted his atheism to his parents: they were at odds themselves, as an Anglican schoolteacher who had served in WW1, and a pacifist Wesleyan Methodist who was interned in HMP Holloway in May 1940, under Section 18B. What l relish, and admire, in what l have already listened to in the podcast is the complexity and individuality of both speakers. Kieran McC is extraordinary in his account of his academic approach, and its development. Peter Heathwood’s account conveys the manifold losses and injustices he and his family have endured, and continue to endure, and the ways in which injustice is sanctioned by the state. I would add a personal note: my own uncle, a Catholic QC, was shot at point blank range in his own hallway, and died in front of his children, aged 8 and 16. This was in 1974. In 2011 the elder of my cousin’s brought a copy of the Historic Cases review that had just been given to the family, and we read it through together. I’m thinking that even tho Peter Heathwood regrets that his family doesn’t ‘qualify’ for such a review, it is unlikely that if they did, it wouldn’t cure, or solve, anything. Thank you for your post and kind comments, which I will forward on to Tim Wilson and Kieran McConaghy at the University of St Andrews, and to Peter Heathwood. I’m so sorry to hear about your family’s loss, and especial thanks therefore for taking the time to write. It is much appreciated.